Muswell Hill near Finchley in North London is another area which is frequently visited by the Shutterly Fabulous team of shutters experts. Full height shutters give coverage of the whole window. The panel open as one unit from top to bottom. And you can choose to have either 1 or 2 larger panels, or more narrower panels hinged together. The bay window of this Muswell Hill property illustrates how a mid rail is used to cause a break in the slats of these full height window shutter panels. This is a great design feature offered to our customers which allows versatility in how the shutters are operated. By having this mid rail split, the slats above the mid rail can be operated to open or close independently of the slats situated below the mid rail. 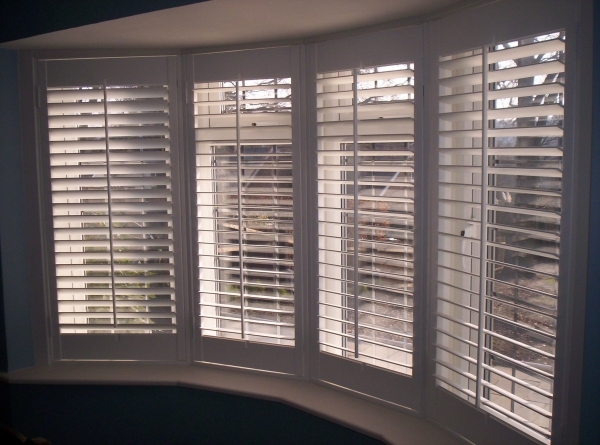 This is a popular design of window shutter where the window looks out on to a busy street, which allows you to open the top section of slats whilst tilting the bottom level of slats so that privacy is retained. The shutters chosen on this Muswell property have been finished in Shell paint on our poplar wood. We have a range of paint colour finishes and wood stains for you to choose from, but if you have a specific requirement we can supply you with a custom colour sample made up to match your colour requirements at an extra cost to make sure that this is definitely the colour you wish to go with. If you do decide on a custom colour, your shutters can be finished in this custom colour with our UV protective lacquer on top to ensure the paint or stain finish applied to your interior shutters does not fade with the effect of the sun. This protective coating also allows for easy wiping down with some warm water and a damp cloth. The custom colour for your shutters can be provided to you at an extra cost option, being 15% additional charge for your shutters.